If you’re looking to save some time while using Minitab Statistical Software, check out these tips for setting default options. What Are the Options in My Statistical Software? 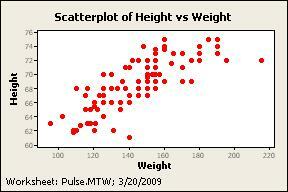 Options are default Minitab settings that you use each time that you create a graph or conduct an analysis. Some options are global in nature (What color would you like your graphs to be? 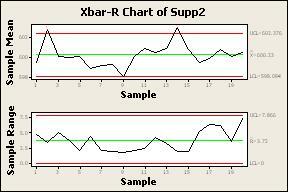 ), while others pertain only to certain graphs or tests (What tests should I perform when I create control charts?). Some options have the effect of selecting items for you as you create a graph or perform an analysis, thereby saving you time in dialog boxes. A few affect changes that are otherwise made only by editing output, which is also a time saver. Some even offer capabilities that are available only as options. If you find yourself consistently editing the same aspect of your graphs and charts, you can change the default options settings for that feature. You can set options for fonts, symbols, graph size, footnotes, labels, ticks, and much more. Statisticians sometimes disagree about the best methods for estimating certain parameters. Similarly, acceptable standard values (like alpha levels) may vary from person to person or company to company. Options allow you to choose and use your preferred test methods and parameters. Navigate to the area that you want to change and make the changes. 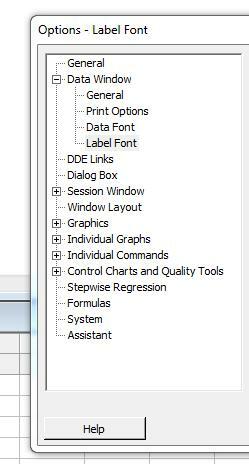 This new options setting affects the remainder of your current Minitab session, as well as future sessions. The setting does not retroactively affect output that you’ve already created. Minitab offers many more options than what I've mentioned here. You can explore all of the options by navigating to Tools > Options. You’re sure to find a setting that will streamline your Minitab sessions!